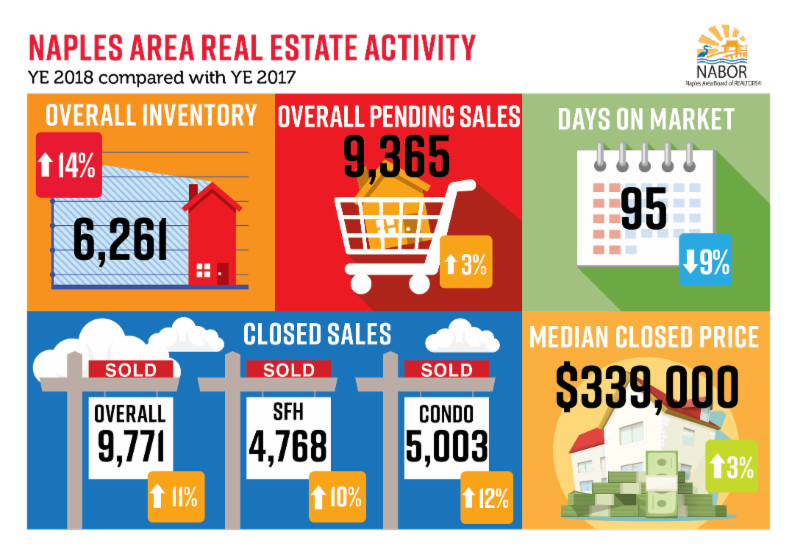 Naples, Fla. (January 18, 2019) - The Naples area housing market ended 2018 with impressive annual activity statistics in all areas of the residential real estate market including an 11 percent increase in total closed sales and a 14 percent increase in inventory compared to 2017. Sales of homes over $1 million continued to drive the market in 2018, especially in the condominium market where closed sales of condominiums over $1 million increased 37 percent! According to the Year End 2018 Market Report released by the Naples Area Board of REALTORS® (NABOR®), which tracks home listings and sales within Collier County (excluding Marco Island), inventory at the end of 2018 was the highest on record in six years. Location, location, location continues to offer appeal! The median closed prices listed on NABOR®'s market reports do not reflect average sales prices. Rather, the median closed price demonstrates a rate wherein half the closed sales were purchased for amounts below the figure (median) and half the sales were purchased for prices above it. 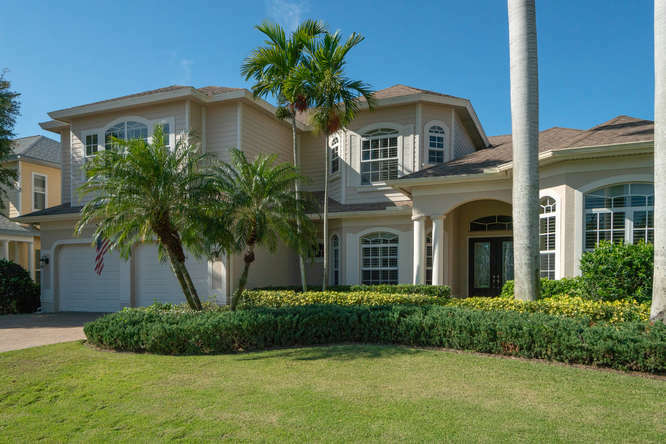 As such, of the 662 single-family homes located in the Naples Beach area that sold in 2018, the median closed price was $1,268,000 in 2018 compared to the 652 single-family homes that sold in 2017 where the median closed price was $1,117,000. Incidentally, closed sales in this area increased only 2 percent. Conversely, closed sales of single-family homes in the Ave Maria/Immokalee area increased 233 percent to 143 homes in 2018 compared to 43 single-family homes in 2017. Median closed prices for single-family homes in the Ave Maria/Immokalee area decreased 4 percent to $245,000 in 2018 compared to $255,000 in 2017. According to Kathy Zorn, broker/owner, Better Homes and Gardens Real Estate Pristine, many small builders are listing their newly constructed homes on the Southwest Florida MLS (multiple listing service), which is reflected in the increased inventory statistics in all price points and in all geographic locations. "Inventory for single-family homes under $500,000 increased the most in 2018, which is good news for buyers who don't necessarily require a home within walking distance of the beach. In fact, the highest increase in inventory for 2018 was 34 percent, and it appeared in the under $300,000 single-family homes category." While the Ave Maria/Immokalee area also reported the highest increase in single-family inventory (40 percent) among all geographic areas tracked, the single-family home inventory in Central Naples (34104, 34105, 34116) increased 38 percent to 391 homes in 2018 from 283 homes in 2017. Even though the Southwest Florida MLS system is not as widely used by REALTORS® working in commercial real estate in Naples, the data collected does help agents gauge this sector of the market. According to Wes Kunkle, President and Managing Broker at Kunkle International Realty, "Vacancy rates for commercial properties are low right now. I'm seeing most vacancy rates well under 5 percent." Historically, commercial real estate activity is directly affected by the residential real estate market. When nearly 1,000 more homes are sold annually compared to a previous year, as was the case between 2017 and 2018, it is realistic to expect the number of businesses will increase to meet the needs of those new consumers. Dozens of new commercial properties are in various stages of development across Collier County, many of which have large grocery store anchors. If you are in the market to buy or sell your home in Southwest Florida, give me a call for assistance. I can do a market comparison and determine a fair and reasonable listing price, both with and without renovations. I can also identify properties best suited for your needs and negotiate a purchase price that fits your budget. Discover more at www.NaplesPropertyPreview.com or call me at 239-821-2370.